The area generally referred to as California's "Wine Country," which is Napa and Sonoma Counties, has hundreds of wineries and covers an area of about three hundred square miles. Without a plan, you could drive around and sip some wine, but you can do better. Take a little time to think about your goals and make a few reservations and your day can go from "meh" to "Wow!" It sounds too simple, but it's something a lot of people don't consider — and it makes a difference. BeSadly, some places with big names are short on hospitality. fore you go wine-tasting, decide why you're going. Do you want to learn more about wines and how they're made? Take one of these recommended winery tours. Do you want to visit specific wineries? Find their website, check their hours and find out if they require reservations (many do). Take a moment to read some reviews. Or do you just want to have a nice day and drink a little wine along the way? See Casual Wine-Tasting below. Do you want to buy or sample a specific type of wine? See the tips below for targeting specific wine types. The no-brainer way to go wine-tasting in Napa Valley is to drive along Highway 29, stopping at a few places, perhaps those whose name you've heard, or ones that look nice. Using this strategy, you'll probably have a nice time. But with that approach, you're guaranteed to miss the best that Napa Valley has to offer, the special places among the hundreds of wineries you pass along the way. Professional Wine County tour guides and dozens of visits went into creating lists of truly special, beautiful, educational and fun wineries for you to visit. Click on over to the Napa Valley list or the Sonoma Valley list and in a few minutes, and you can put together a wine-tasting trip you'll never forget. If you want to sample specific types of wines such as Chardonnay or Pinot Noir, you'd might as well taste the best. A one-month paid subscription to the Wine Spectator online costs less than $10 and will give you access to an excellent search tool that can help you zero in on places to visit. The specific vintages listed may be out of stock, but if a winery shows up often, they probably know how to make that type well. After you've picked your target wineries, check their wine tasting policies and hours. Don't be shy about making an appointment if it's required. Often, it's not the winery being snooty, but rather the conditions of their license that don't allow drop-in visitors. If you are looking for some great new finds from small wineries, try the wine tasting bars in downtown Napa or Healdsburg. They offer a wide variety of wines from boutique wineries that don't have their own tasting rooms. Most Napa Valley wineries charge at least $20 for a bar tasting, or even more. You will usually choose three to six wines from a list of ten or so, getting a small amount of each. 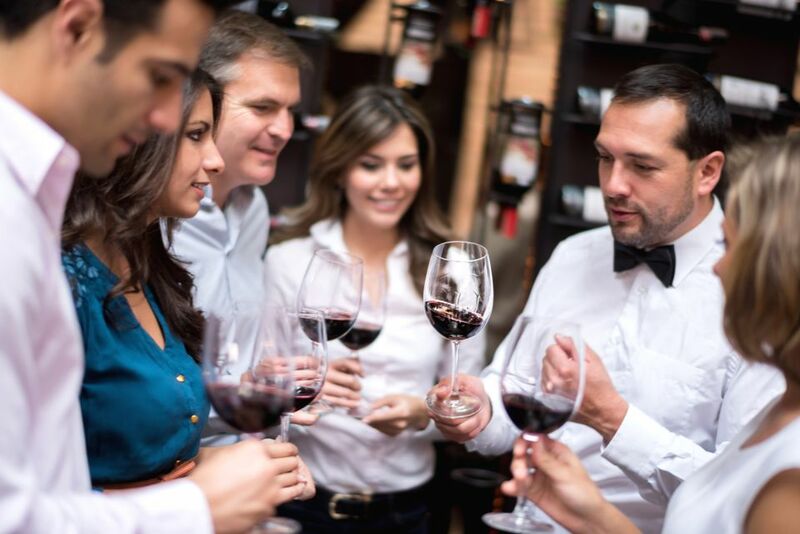 If you're traveling with someone who doesn't mind sharing your glass, try this to stretch your tasting dollar: Buy one wine tasting and sip from the same glass. Don't be embarrassed to pour out the rest of the wine from your glass after you taste it. The pourer won't be offended. In fact, they might think you're a serious wine-taster and they might even bring out something special for you to try. Professionals never swallow when wine tasting. There's a reason for that - they don't want to get intoxicated. But you're probably not going to do that. Instead, follow this simple rule for casual wine tasting: Never go to more than three wineries in a day. If you try to drink at more than that, you're likely to get intoxicated (dangerous for driving). Even if you don't go over the limit, all the wines start to taste the same, and you may buy something you'll later regret. To keep from getting dehydrated, take water with you. After every winery stop, drink at least the same amount of water as the amount of wine you consumed. It also helps to go wine tasting on a full stomach, which slows the alcohol absorption. Even on a cool but sunny day, the inside of a car can get hot enough to "cook" that nice bottle of wine you just bought in just a few minutes. Take along a cooler or a styrofoam wine shipping container to hold your bottles. A visitor could easily spend weeks in California Wine Country, tasting world-class wines and enjoying the restaurants and activities, but you can also get a good feel for the area in a one-day trip. We've put together some lists of wineries that offer the best visitor experience by area. Use the guide to the best Napa Valley Wineries to find places the deliver the best experiences for casual visitors and serious wine snobs alike. You can also check out the top wineries in Sonoma Valley or find the best places to go wine-tasting around Healdsburg.